We are already aware that the Galaxy S10 repairs aren’t going to come cheap. Samsung has now released the official screen repair prices for the devices in Taiwan, and as expected, they cost a pretty penny. Naturally enough, the repair cost of the Galaxy S10+ is highest among the three siblings. One screen replacement of the device may cost you as high as 7,100 NT$ (~$230). The pricing in Taiwan is similar to what Samsung is charging for Galaxy S10 screen replacement elsewhere. The Galaxy S10 screen can be replaced the part isn’t exactly cheap. One screen replacement costs 5,350 NT$ (~$173) for the S10e, 6,450 NT$ (~$209) for the S10, and 7,100 NT$ (~$230) for the S10+. These are official repair prices and are applicable on screen replacement of devices that have passed the warranty period, or if the screen is damaged due to accidents during the warranty period. The Galaxy Note 9 screen replacement costs 5,500 NT$ (~$178). The Galaxy S10+ also features a same 6.4-inch display. However, the fact that the latter packs an Infinity-O display along with Dynamic AMOLED technology is why its repair price is much higher than Note 9. Furthermore, it also houses the ultrasonic in-display fingerprint sensor. As you saw in this Galaxy S10+ drop-test, a fall from a height of about five feet is enough to shatter your device. A drop like that could cause a dent in your pocket. Hence, it is always recommended to be careful with your stuff, or you might end up spending big on repairs. Update: Accurate currency conversions added. I got a free nanofixit insurance from samsung for pre ordering my S10+ worth 10,000PHP ($189) but sadly its only for 30Days. With these prices Smartphones are becoming a thousand dollars disposable items. If you break it, discard it and get a new one. 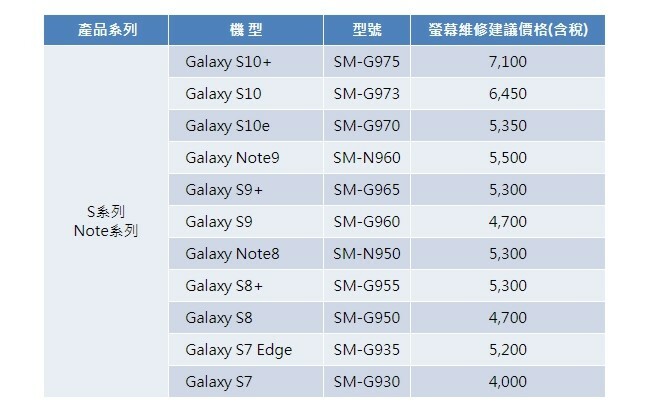 There is a big mistake here, this prices are not comming from Samsung China but from Samsung Taiwan, they are in NT$ (New Taiwan dollar) and not in Yuan. Prices are ridiculous even for older models. Who would pay 600 dollars for a Galaxy S7 screen replacement? Something doesn’t add up. Mine it cost me 12,000PHP ($226) for the Screen, frame and battery replacement of my S7 back in the day. Got a free replacement for the back glass as Samsung service center accidentally removed some paint. It looks and Feel new after that. Better to buy new S10. This makes a lot more sense. Screen repair for the price of the phone new and even higher is roflmao.